Get ready to have some fun in the sun! 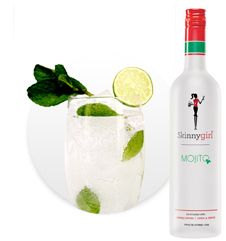 From chic soirees to splashy waterside bashes, Skinnygirl® Cocktails has everything you need to add some sizzle to your outdoor bash. Our hot foursome has it all! Paper cups? Not at your party! Get into the summer spirit with charming mason jars, rimmed with everything from sprinkles to fresh mint. Deck out your glasses with playful straws in vibrant hues and patterns like polka dots and stripes, along with pretty ribbons adorned with nametags to ensure your ladies won’t lose their drinks. As a bonus, the multipurpose jars can double as décor, like shabby-chic candleholders and vases, or adorable individual serving dishes. The best way to beat the heat: stay hydrated with plenty of water. Encourage your girls to drink up by adding in cucumber slices, berries or mint. And let your ladies catch a summer breeze even on the driest of days by passing out handheld fans. Create a fab outdoor lounge worthy of your ladies. For chic seats, pretty up patio furniture with an array of comfy, colorful cushions, and drape light blankets on top – trust us, your girls will thank you when temperatures drop. Music can make – or break! – your bash. To get the party started, fill your playlist with girly summer anthems. And don’t forget to bring portable speakers for beach getaways and grassy get-togethers. Want to make a big splash at your soiree? Try these twists on traditional ice. Extract juice from limes and combine with other ingredients. Pour mixture halfway into ice cube tray and freeze. Once solid, place a single fresh mint leaf over each cube. Cover with water and refreeze. Remove when frozen and add to cocktail. Garnish with fresh mint. To segment grapefruit, begin by cutting off top and bottom with a paring or chef's knife and place on cutting board. Cut around grapefruit to remove rind. While holding grapefruit, cut between pith to remove each section. 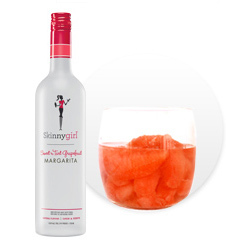 Lay segments flat in a glass freezer-proof container and freeze. Remove when frozen and add to cocktail. Garnish with a fresh grapefruit slice. *Note: You can also buy ready-made grapefruit segments in the produce section. 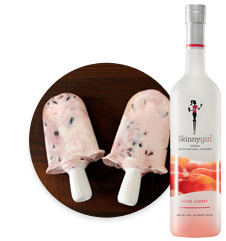 Combine yogurt and vodka and stir in chopped cherries. Freeze in your popsicle maker of choice or in a 5 oz. paper cup with a popsicle stick. Whether you pack a picnic or host a cookout, these delish eats will fill you up without weighing you down. Heat olive oil in a skillet and cook shallots and onion over medium heat until translucent. Remove and set aside. 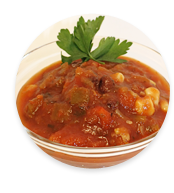 Place ½ of the roasted tomatoes in a blender with lime juice, cumin, cayenne and onions. Blend until combined, but not completely pureed. Add in lime juice, black beans, corn and remaining tomatoes. Pulse 2-3 times until well-combined. Adjust salt and pepper to taste. Serve with plantain chips. 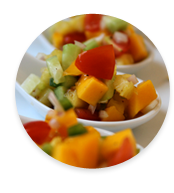 In a large bowl, combine mango, pineapple, tomatoes, cucumber, jalapeno, shallots and cilantro. Squeeze the juice of two limes over the fresh mixture and stir to combine. Salt and pepper to taste. Serve with plantain chips. Combine first four ingredients and whisk together. Slowly whisk in olive oil. Adjust salt and pepper to taste. If you use frozen, shelled edamame, first rinse under hot water in a colander for at least 30 seconds. Set aside. Cut the head of romaine lettuce into fourths, making sure the core remains intact. 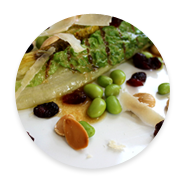 Brush your medium-hot grill with olive oil, and arrange each quarter of romaine lengthwise across the grate so it lays perpendicular to the slats. Sprinkle with salt and pepper. Grill each side for about 45 seconds, turning once with tongs. Remove from grill to a cutting board. Cut out core and divide lettuce onto four salad plates. Top each plate with ¼ of edamame, cranberries and almonds. Shave ½ ounce of Parmesan cheese onto each salad. Serve with miso vinaigrette.